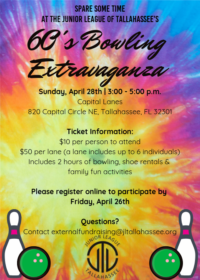 Come spare some time at the JLT 60’s Bowling Extravaganza fundraiser on Sunday, April 28 from 3:00 p.m. to 5:00 p.m. at Capital Lanes bowling alley. The event is open to all ages and dressing up in your best 60’s attire is encouraged! Attendance includes 2 hours of bowling, shoe rentals, popcorn, soda and family fun activities. It is $10 per person or $50 per lane (up to 6 people per lane). The last day to purchase tickets or reserve a lane is Friday, April 26. Tickets must be purchased in advance.